Edmund Charles Tarbell, Three Sisters - A Study in June Sunlight, 1890. Oil on canvas. Milwaukee Art Museum, Gift of Mrs. Montgomery Sears. Photo credit Efraim Lev-er. In my last blog post, I shared with you the secrets of a lovely wooden box which contained a collection of glass lantern slides from about 1920. While most of the slides are black and white, a few colorful slides rest as jewels among them. In the early 20th century, photography was principally a black and white experience. Color photography, an experimental practice at best, was not a terribly viable practice for mass consumers/audiences until the 1940s. Can you picture the Chihuly sculpture in black and white? Or Mark Rothko’s Green, Red, Blue or even Georgia O’Keeffe’s Poppies? Today we live in a colorful world made more so by the convenience of mega-pixel cameras, even those small enough to fit in your phone. 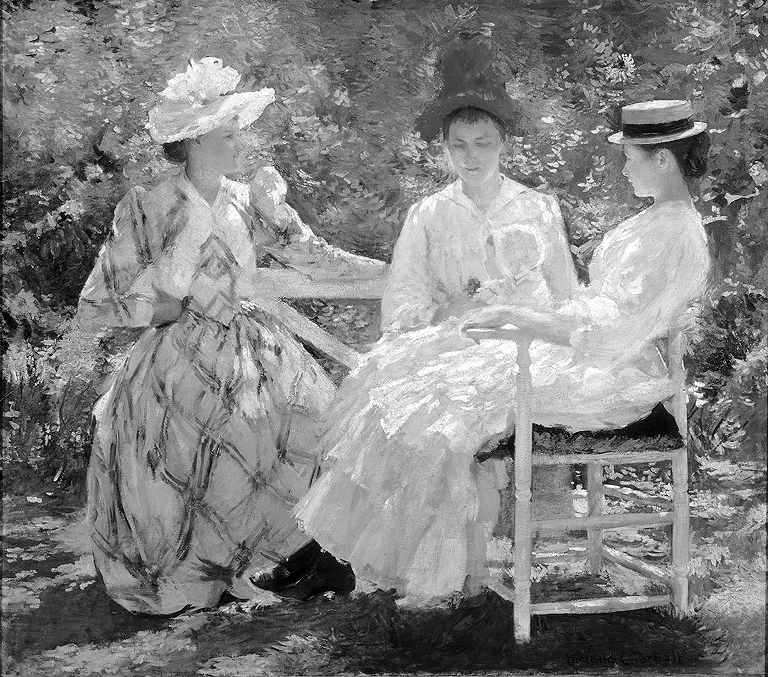 Imagine for example, the impressionist beauty Edmund Tarbell’s Three Sisters – A Study in June Sunlight (1890) by Edmund Tarbell in various shades of gray. Featuring Tarbell’s wife, her two sisters and his baby daughter, the painting is rich in color in every brushstroke. 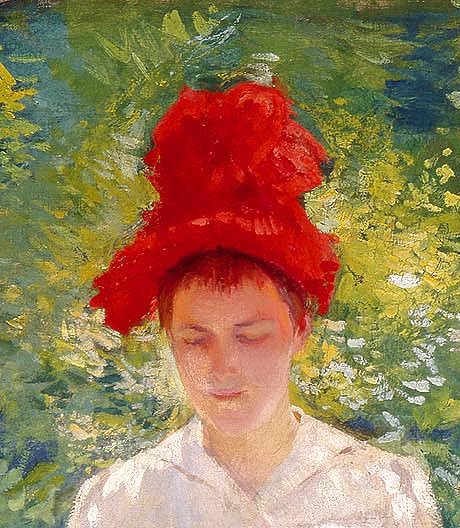 From their perch in the sun-dappled, verdant garden the sitters rest among the dark cool greens of the foliage and are fashionably attired to their very tiptoes, including the vibrant red bonnet. 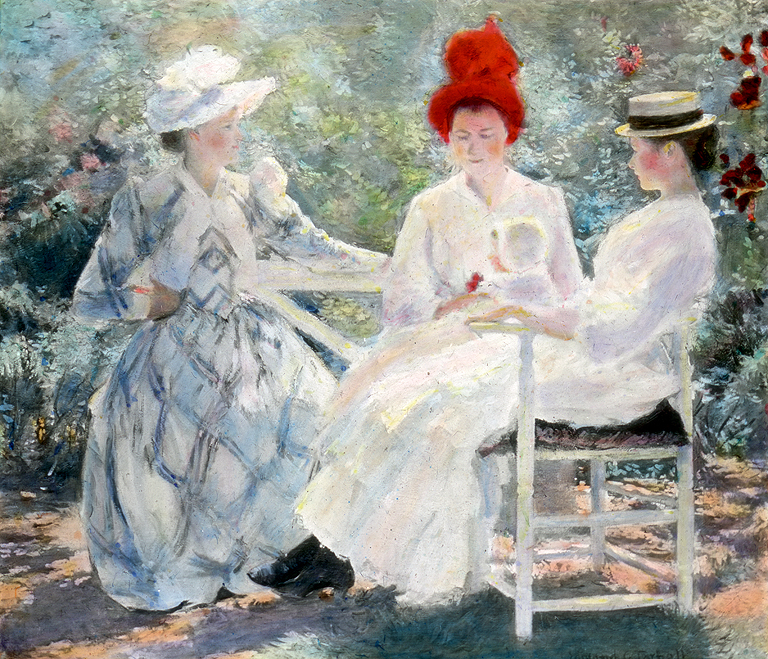 In the digital photograph featured at the beginning of this post, Three Sisters – A Study in June Sunlight shimmers with strokes of bold color which appear to dance through subtle light and shadow. I can barely imagine this image as black and white. If it were black and white, might you recognize the baby in the work, who sometimes seems to blend in to the folds of the ruffled skirt even in full color? The solution for early 20th century art enthusiasts? Hand tinting. Above Left: Edmund Charles Tarbell, Three Sisters – A Study in June Sunlight, 1890. Oil on canvas. Milwaukee Art Museum, Gift of Mrs. Montgomery Sears. Photo credit Efraim Lev-er. Hand tinting or hand coloring was a process wherein an artist applied oils, dyes, water colors, etc. to the negative to enhance the image. In this case, the image was sealed between two layers of glass where it could safely be projected in a simple lantern projector. It is such a treat to have the digital image and tinted image next to one another to see the color variations. The yellows compared to the digital image are nearly absent; the greens are paler, almost becoming blue in some sections, while other shades are darker, such as the red flowers along the right edge of the painting, now more of a dark blackberry shade. Is this perhaps due to the artist’s personal perception of the painting? And, of course, look at that gloriously red chapeau – a dramatic focal point that draws the eye immediately. Above Left: Edmund Charles Tarbell, Three Sisters – A Study in June Sunlight (detail), 1890. Oil on canvas. Milwaukee Art Museum, Gift of Mrs. Montgomery Sears. Photo credit Efraim Lev-er. While through photo representations “we’ve come a long way, baby,” I am sure you’d agree, there’s nothing like seeing the real thing in person! This entry was posted in Art, Curatorial, Library/Archives and tagged 19th Century Art, American Art, Behind the Scenes, color photography, digital photography, Edmund Charles Tarbell, lantern slides. Bookmark the permalink. Oh! 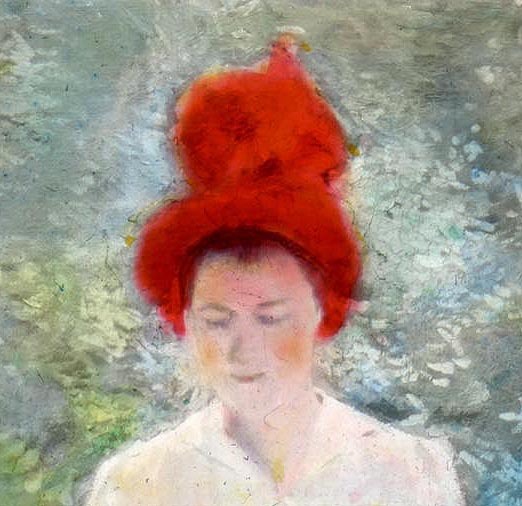 This is really cool Beret… I loved seeing the side-by-side comparisons of the painting and the lantern slide. Share more in the future and thank you! Very interesting! I love the vibrant red hat in both the painting and lantern slide. It’s great that you have two forms of the painting for comparisons.